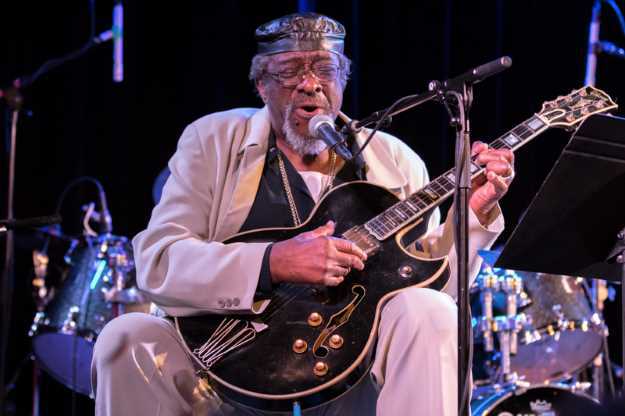 SAN FRANCISCO - When legendary electric guitarist James Blood Ulmer stepped onto the stage at The Chapel Thursday, the crowd broke into an impromptu round of "Happy Birthday." 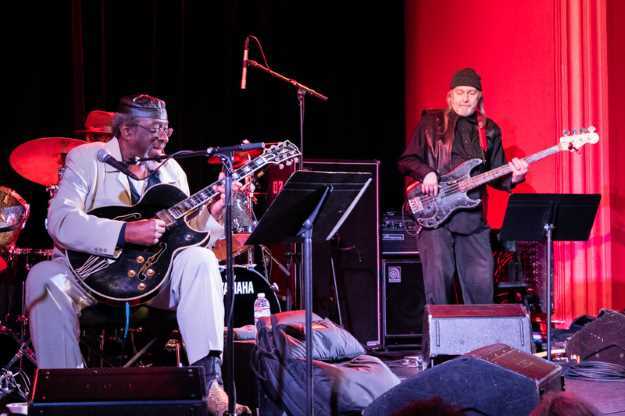 Ulmer, who turns 79 on Friday, was performing with Third Rail, his collaboration with experimental bassist Bill Laswell and legendary funk drummer Jerome "Bigfoot" Brailey. The concert was part of four-night residency for Laswell, featuring a wide variety of musical collaborators, including ex-Slayer drummer Dave Lombardo, legendary bassist Jah Wobble, guitarist Fred Frith, DJ Logic and many others. Third Rail began as a collaboration between Laswell, Ulmer and original drummer Joseph "Ziggy" Modeliste in 1993 as an avant-jazz power trio inspired by Cream. Brailey replaced Modeliste after the band recorded its first album, South Delta Space Age, in 1995. Third Rail's lineup boasts a legendary lineage in at least three musical genres. Ulmer has played with jazz giants Ornette Coleman and Rashied Ali; Brailey has been a member of Parliament, The Chamber Brothers and the Five Stairsteps. Laswell has collaborated with everyone from Brian Eno and Buckethead to Wayne Shorter and Bernie Worrell. Thursday night's set featured a variety of material. The first song was a funky jam that saw Laswell coaxing amazing synth sounds from his bass while Ulmer fired wah-wah-inflected notes over Brailey's drumming that sat perfectly at the Lagrange point between jazz, funk and rock. At times the music was nasty funky. James Blood Ulmer, wearing a linen suit and leather hat, was seated for the performance and strummed his Gibson Byrdland guitar with his thumb, magically coaxing sinuous riffs and vowel-like notes from the instrument. During the second song, he sang warbling and soulful vocals about funk, including the line "funk me and funk you," with a huge smile on his face. The brooding funk groove of the third song had the seated audience swaying. Toward the middle of the set, the rest of the band sat out while Ulmer played several songs by himself. After an extended retuning of his guitar, he launched into a solo rendition of his 1980 song "Aren't You Glad to Be in America," taking a moment to ask fans, "What about Trump?" Next, he played a song that contained the powerfully relevant line, "Somebody got to be the president of hell, because there's a whole lot of people down there." 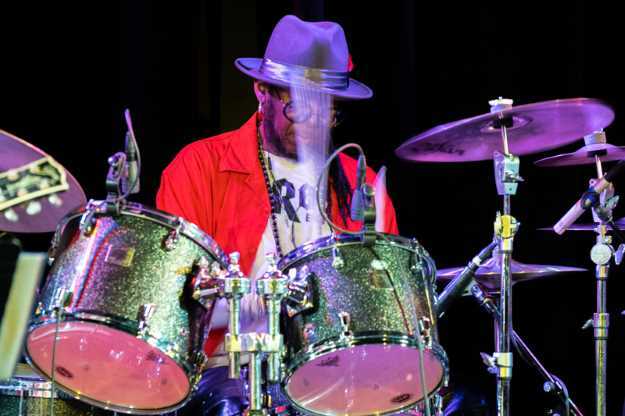 After thanking the crowd, Ulmer played two more songs largely unaccompanied before Laswell and Brailey got back into the action for a fairly conventional-sounding blues song that featured a devastating drum solo by Brailey. Toward the end of the show, Laswell and Ulmer stretched out and really began to explore the improvisational territory they had staked out. Laswell again coaxed unbelievable synth sounds from his bass, and Ulmer created sharp, glass-like shards of chords and single notes that glittered in the air. Brailey added an ever-growing retinue of drum fills and syncopated splashes from his high-hat cymbal. After about an hour the band stopped and Ulmer walked slowly and carefully off the stage. But the audience wanted more. After a solid five minutes of clapping and stomping, the trio reemerged on stage for a final jam. Again the funk got the aging fans moving in their seats. The music was gritty and urban, seemingly informed in equal parts by blues, jazz and rock. When Ulmer stood up again after the final jam, the audience gave the guitarist a standing ovation as he raised his fists over his head. Laswell's residency at The Chapel concludes Feb. 8.